This is our brand-new Multi-functional baby highchair. 3 position adjustable front tray, 3 position, reclining, adjustable seat. 5 point harness system. 2 trays. Regular tray and removable, dishwasher safe insert tray. Removable tray includes two cup holders and large main compartment. Main tray features one spacious, indented compartment. Removable, washable seat pad (100% polyester fabric with polyester foam padding). For use from 6 months (when your child can sit unassisted) and up in the highchair, and approximately 4 years when converted to a play table and chair. SAFE & COMFORT - Constructed by the safe material of PP and PE, this high chair is extraordinarily durable and stable for your baby sit on for eating, playing, etc. Filled by soft sponge which offers your baby a comfortable seat on matter how long they sit. 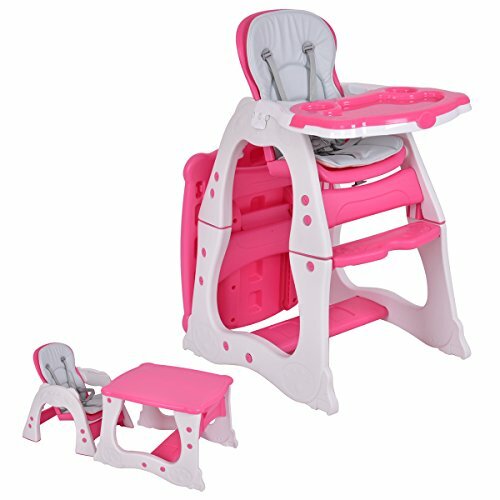 3-IN-1 DESIGN - 1. high chair; 2. booster chair; 3. table and chair set. Costzon baby high chair can be easily converted to individual play table and chair to accompany your baby from infant to preschool. You only need to pay for one and get 3 useful furniture for your baby! THREE POSITION TRAY - You can adjust the position of tray according to your baby's requirement. There are 3 positions available. No longer worry that it will be too small to sit when your baby is growing. The top tray with socket is dishwasher-safe and removable, which is convenient for drinks or snacks. 5-POINT SAFETY BELT & ADJUSTABLE SEAT BACK - Keep baby safe and comfortable with 5-point safety restraint system. 3 position reclining and adjustable seat is well designed to give you baby a proper seat. EASY TO KEEP CLEAN - Wipes clean with damp cloth and mild soap. We at Costzon stand behind our products with our Satisfaction Guarantee. We not only offer qualified products with favorable price to our customers, but also great customer service.